Lance Martinez from My Detroit Sports provides this up close look at one of the greatest players in baseball history. Behold a Miguel Cabrera autograph signing event, which recently occured at TigerFest, Detroit’s offseason fan event at Comerica Park. Last season, the now 33-year-old legend hit .316, with 38 homeruns and 108 RBI. For his career, the Venezuelan slugger boasts of a .321 batting average, with 446 homeruns and 1,553 RBI. The guy’s stat line is simply incredible. The future hall of famer’s résumé also includes winning the AL batting championship four times, along with both the homerun and RBI title on two occasions. The 11-time All-Star earned AL MVP honors in both 2012 and 2013, while of course winning the Triple Crown in ’12. Oh, and he also won a World Series with the Marlins, way back in 2003. Miguel Cabrera has simply done it all, including signing autographs for some very happy Tigers fans, on this cold winter day. 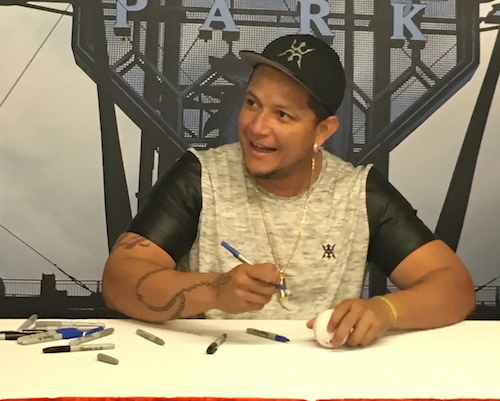 Cabrera fans can check out other behind the scenes looks at the superstar, via this link.